It seems to be tradition, as of late, that the media picks one horror movie each year and over-hypes it to the point where it could never meet expectations. Last year Hereditary was the “Exorcist of this generation”…uh, not quite. 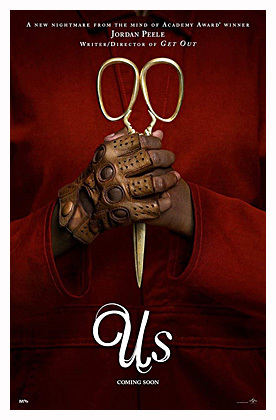 This year it’s Jordan Peele’s intriguingly weird, but slightly underwhelming Us. Movie starts out in 1986 were young Adelaide (Madison Curry) wanders away from her parents while visiting the Santa Cruz boardwalk and has a traumatic experience in a funhouse. Years later Adelaide (Lupita Nyong’o) returns to that area with her husband Gabe (Winston Duke), athletic daughter Zora (Shahadi Wright Joseph) and younger son Jason (Evan Alex). Adelaide reveals to her husband that in that funhouse she encountered a doppelgänger of herself and it terrified her. Gabe has a hard time believing her until said doppelgänger (also Nyong’o) shows up at their door one night with her own duplicate family (also Duke, Joseph and Alex). The Wilson duplicates are violent and vicious and lay siege to the house. As the Wilsons must go on the run and fight for their lives, it soon becomes apparent that this event is only the start of something far larger and more horrifying. Peele writes and directs and he not only has some interesting and unusual ideas, he is also a very sound director with an effective visual style. Yes, the concept behind this initial home invasion is original and quite weird and it gets even stranger once the story opens up in the last act, but it’s just that it simply isn’t that scary. At first, the doppelgänger arrival is chilling, as we are introduced to the anti-Wilsons and their intensions, but it flattens out a bit as it starts to follow the routine home invasion flick formula, which was never thrilling to begin with. Thanks to some conveniences, like a boat that malfunctions and then works exactly when you need it too, the Wilsons escape and go on the run to a neighbor’s house, but even then it remains uneven. The televised footage of what appears to be a doppelgänger invasion is creepy, but it’s effectiveness gets neutered by the Wilsons adapting to this bizarre scenario far too quickly. They no longer seem scared, or even fazed by killing, as they sit surrounded by bloody bodies munching on snacks in their friends’ gore-spattered house. Your friends lay there murdered and you raid their pantry? That and Gabe even remarks that he wants to stay there as if to enjoy the spoils of their dead neighbors’ home. Worse still, moments later they are arguing who should drive their neighbors’ car based on who has the largest kill count after battling their neighbor’s vicious doubles. Really? Not sure what Peele was going for here, a message about society’s desensitization to violence, perhaps? Was it simply supposed to be funny? The Wilsons were portrayed as a nice, fun family up till this point, now they are bragging about body count. It’s just off-putting. The finale in mysterious tunnels beneath the boardwalk returns the film to a more unsettling tone and we get some answers that are weird and original. Thought the film, itself, is still left with a lot of questions. We also get a reveal that is not totally unexpected, but at this point it doesn’t add much. As the credits roll there is a sense that Peele is an inventive filmmaker with some interesting things on his mind, though the film itself is never quite as unnerving as Get Out, which was also ridiculously over-hyped. The director has a good cast. Performances are not an issue here. Lupita Nyong’o is strong as Adelaide and her sinister yet tragic double “Red”. She’s a woman with some issues, but she rises above her fears to fight for her family. Winston Duke is also fun as the big teddy bear dad, Gabriel. He’s not as strong as his wife, but he seems like a good man. Shahadi Wright Joseph is good as the athlete of the family Zora and is very creepy as her doppelgänger Umbrae. Evan Alex also does good work as Jason and is extremely spooky as his burned faced copy, Pluto (a Hills Have Eyes reference maybe?). Rounding out are Elisabeth Moss and Tim Heidecker as the before mentioned friends and neighbors, the Tylers. They seemed a little too superficial to be the type of people the WIlsons would hang with, but obviously they don’t last too long. Overall, the film is far from a masterpiece and doesn’t come close to the hype, but is still worth a look for those curious. Peele is a talented filmmaker and has some inventive and clever ideas, but he hasn’t quite locked down a few things yet to make his flicks more than occasionally unnerving or unsettling. Evoking those emotions are not bad, but this film, especially, needed to be more consistent and never really got truly terrifying, though it had potential. There are some weird and unique ideas here that might stick with you, but it’s never quite scary enough to make it really special. Our likable family doing some questionable things that seem uncharacteristic, even in a scenario like this, also held it back. Peele may have a classic flick in him, but just not yet. Carpenter took a few films to get to his Halloween, hopefully Peele’s is on the horizon, too…it’s just not Us. 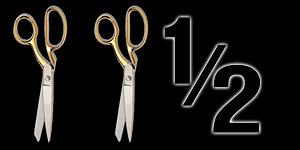 Rated 2 and 1/2 (out of 4) shears.